Visual representation of the evolution of the European continental ecosystems across the Cretaceous-Paleogene Boundary Extinction Event: the diverse vertebrate assemblages of the latest Cretaceous, with dinosaurs, crocodiles, turtles and mammals (bottom image; see ZooKeys review of Csiki-Sava et al., doi: 10.3897/zookeys.469.8439 for the identity of the different taxa represented), were wiped almost completely, with only a few groups (here epitomized by certain mammals and turtles) surviving into the Paleogene (top image). 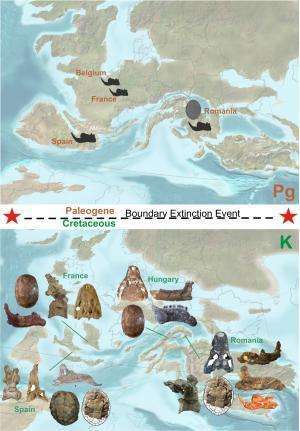 The backgrounds show more or less accurate reconstructions of the European paleogeography during the latest Cretaceous (bottom; K), respectively the Paleogene (top; Pg). Credit: Background paleogeography reconstructions - Dr. Ron Blakey, Professor Emeritus Northern Arizona University; fossils: Dr. Jeremy E. Martin (for other fossil image credits see the ZooKeys paper of Csiki-Sava et al., doi: 10.3897/zookeys.469.8439). Dinosaurs flourished in Europe right up until the asteroid impact that wiped them out 66 million years ago, a new study shows. The theory that an asteroid rapidly killed off the dinosaurs is widely recognized, but until recently dinosaur fossils from the latest Cretaceous—the final stanza of dinosaur evolution—were known almost exclusively from North America. This has raised questions about whether the sudden decline of dinosaurs in the American and Canadian west was merely a local story. The new study synthesizes a flurry of research on European dinosaurs over the past two decades. Fossils of latest Cretaceous dinosaurs are now commonly discovered in Spain, France, Romania, and other countries. By looking at the variety and ages of these fossils, a team of researchers led by Zoltán Csiki-Sava of the University of Bucharest's Faculty of Geology and Geophysics has determined that dinosaurs remained diverse in European ecosystems very late into the Cretaceous. In the Pyrenees of Spain and France, the best area in Europe for finding latest Cretaceous dinosaurs, meat and plant-eating species are present and seemingly flourishing during the final few hundred thousand years before the asteroid hit. Dr Csiki-Sava said "For a long time, Europe was overshadowed by other continents when the understanding of the nature, composition and evolution of latest Cretaceous continental ecosystems was concerned. The last 25 years witnessed a huge effort across all Europe to improve our knowledge, and now we are on the brink of fathoming the significance of these new discoveries, and of the strange and new story they tell about life at the end of the Dinosaur Era." Dr Steve Brusatte of the University of Edinburgh's School of GeoSciences (UK), an author on the report, added: "Everyone knows that an asteroid hit 66 million years ago and dinosaurs disappeared, but this story is mostly based on fossils from one part of the world, North America. We now know that European dinosaurs were thriving up to the asteroid impact, just like in North America. This is strong evidence that the asteroid really did kill off dinosaurs in their prime, all over the world at once." The new study is published in the open access journal ZooKeys. It reviews the fossil record of Late Cretaceous land-living vertebrates (including dinosaurs) from Europe and provides the most up-to-date survey of how these animals were changing in the run up to the asteroid impact. Dragons are born in hell. Dragons hate people. You have to kill them. If an animal attacks you, pray to Grigorij "Novyj" Rasputin. We need to k-i-l-l the dinosaurs before they eat us. Meet me at Volga River soon. First dinosaur will come out of Volga River in Russia. Humans were created about 7525 years ago. Birds participate in time creation. It's a sin to kill birds. Dinosaurs live under our level. They will get out through sinkholes and lakes. To kill them, go for their nerves. So, save the birds, but kill the dinosaurs. Oh, and feed the pigeons, please. to bless your house. Forgive me. "Dragons are born in hell. Dragons hate people. You have to kill them...."
Um sorry. I'm an actual Eastern-rite Catholic and every time I see this, I'm spewing soda out my nose. Orthodox church ladies are masterful cooks, but this is just....bizarre. Please don't spit in my pirushki, lol.